Built-in entrance with zipper for your privacy,non-top design never limit the height of people and it won't be stuffy inside. Easy to open and fold up,so it won’t occupy many space when you don’t use it.It’s portable,convenient to carry to wherever you want to go. The tent has no bottom, you don’t need to take off your shoes to get in there,which saves much time for you. 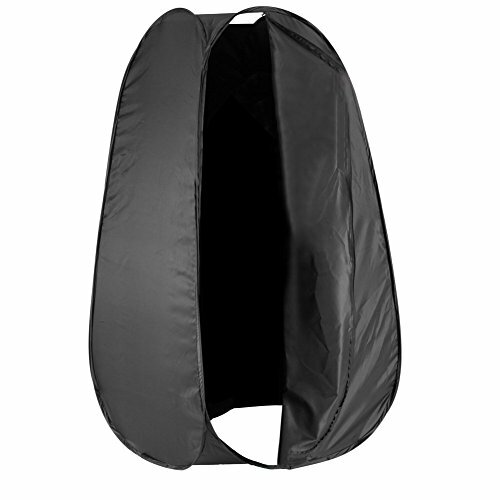 You can take the tent to the beach camping,photo shoots and other indoor or outdoor places. Easy to use and set up,fill the sandbag with gravel,sand,rocks or other heavy material to add weight for stablizing the tent. The tent has the built-in entrance with zipper, which gives you privacy for you or your models to change clothes while in outdoor shooting. It also can be used for outdoor activities,such as camping, swimming, boating, etc. It comes with no bottom then you can save your time taking off and on your shoes. With no top to provide the sunlight or the light,then you don't have to prepare other lights to take inside. The nylon material is durable and washable. It’s easy to open and fold up,helping you carry it more convenient. The changing room is completely discrete and gives you peace of mind while you change clothes. It is supported by flexible steel frame that are sewn into the fabric. Just taking the carrying bag around, and unfold the tent.